When we think about sports and the Great War, an image often rises and that is the one of the British football players: the ball is exactly in the centre of the picture, three men are jumping and their heads are bent to hit it. The other players seem happy, even not concentrated on the game. If you still haven’t understood the image we’re talking about, just search it with the keywords "football" and "great war": it’s going to pop up immediately. But football is not the only sport practiced during the war time, and we would like to start a new journey through sports during the Great War from rugby and from a moving and magnetic book that the historian Stephen Cooper wrote. The Final Whistle. The Great War in Fifteen Players (The History Press, 2012, £ 14.99) is an excellent attempt to track the impact of Great War on the lives of fifteen players belonging to the Rosslyn Park rugby club. Nobody came back alive from that war. 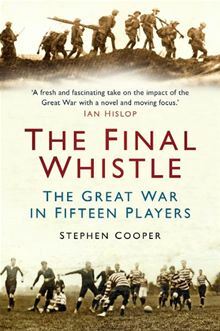 Cooper’s narrative strategy is simple and clear from the incipit: “This is the story of fifteen men and more who heard that first shrill blast and answered its call to arms; they did not live to hear the final whistle that ended the game”. So here are the names of these players, since it makes sense to remember them all: Charles George Gordon Bayly, Guy du Maurier, Alec Todd, Eric Fairbairn, Nowell Oxland, Jimmy Dingle, Syd Burdekin, Guy Pinfield, John Bodenham, Wilfred Jesson, John Augustus Harman, Denis Monaghan & J.J. Conilh de Beyssac, Robert Dale, Arthur Harrison, Charles Button. Stephen Cooper allows the reader to follow the protagonists in every theatre of war until the end of their lives. We of course recommend this book to all people interested in World War One and sports, in (social) history of rugby, in the destiny of people who fought that first world war and above all we see in Cooper’s vivid recall what could remain a kind of leitmotif for Centenary initiatives. It seems that also this author is suggesting once again: forget about battles, weapons and strategies for a while. Focus on men, on their stories and these will lead you to discover the undiscovered. For us, there’s one reason more to welcome this book: the chapter 13 is fully dedicated to Robert Dale, now buried at the Giavera British Cemetery in the Treviso province, a stone's throw away from our impalpable headquarter.